The November finance figures are in, and I wanted to share them with you all. 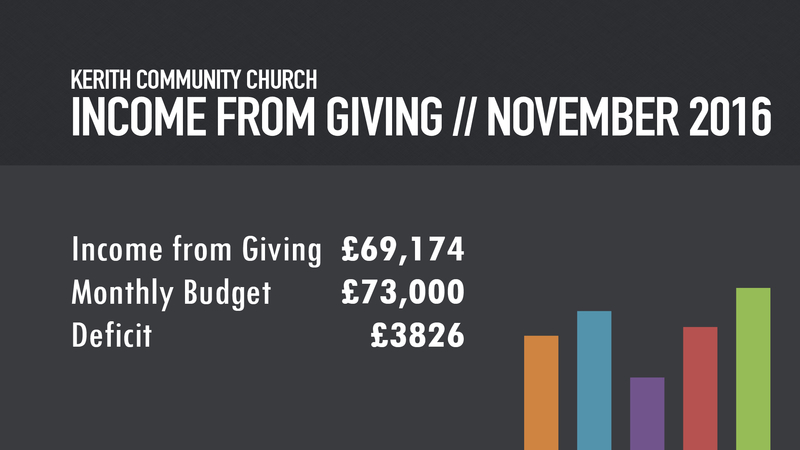 November giving was slightly below budget, but that is in a month where we raised over £212,000 in the Kerith Vision Fund gift days. Overall it was therefore a pretty good month! Year to date we're now just over £10,000 under budget in terms of our giving. We've been managing spending closely this year and so our income still exceeds our expenditure for 2016, but please join me in praying for December giving which will wipe out the deficit and push us into surplus, ready for all we're planning to do in 2017. Let's thank God for his faithfulness to us, both individually and as a community, in providing for us in 2016. He is a good, good Father! I just wanted to take a moment to clarify what's happening in both Sandhurst and Bracknell this weekend, as there's been lots of chopping and changing with the Carol Concerts which has left some people a bit confused! This Sunday there will be no morning meeting in Sandhurst. Instead we'll be hosting our Carols by Candlelight at 4pm and 7pm at Sandhurst School. Over 300 tickets have already gone, but there are still tickets available - get yours and those for your guests here but be quick as it's looking like both events will soon be full! We had an amazing time last weekend in Bracknell. The choir were brilliant, the performance songs were moving and some people even said the preacher was OK! Going through the response cards this week has been very encouraging - 19 people ticked to say they'd made a first time commitment and 33 said they were interested in doing Alpha, with even more saying they wanted to come to church in the New Year and wanted to know more about church. I'm praying for much fruit this weekend too. We've got a regular Sunday in Bracknell this week. Ben Davies is preaching at the 9.30am and 11.30am and Liam Parker at the 6pm. There will be some carols in there as part of the worship, so you won't miss out on all things Christmas! On Christmas Eve we've got our family nativity at 4pm (with live animals!) and our unplugged meeting at 11pm. The on Christmas Day we meet for an hour to celebrate the birth of Christ. All of these are in the Kerith Centre on our Bracknell site. Then finally a reminder that there are no meetings at either site on Sunday 1st January. We'll gather again on Sunday 8th January to start our Headlines series, asking the question "What would Jesus say about Brexit". Following on from our amazing Vision Fund offering of over £212,000 we're moving forward with our plans to redevelop our Bracknell site. Our current thinking is to redevelop our K2 building to give us the facilities we will need to grow over the next 10-15 years (the picture above is a very outline impression from our architect of what that might possibly look like). They're just some of the things I've heard people mention so far - I'm sure some of you will have specific thoughts around those ideas, and others will have completely different ideas. We want to hear all of them! Please do that by filling in this online questionnaire. If some of the questions aren't relevant to you then feel free to skip over them and go on to the ones that do apply to you. We're asking for responses by the 13th January, after which we'll start collating them all and sitting down with each user group to firm up exactly what we want from the redevelopment. Our architects will then start the task of working out how we fit it all in! We do want as many people as possible in our community to take part in this so please take the time to fill it in. If you know people who don't have access to the internet then please let them know this is happening - they can pick up a paper copy of the form to fill in from the Kerith Centre reception. Thanks in advance for playing your part in helping us discern this next step in our journey as a community.